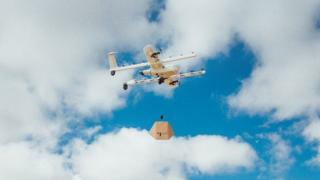 Google’s parent company, Alphabet, will test its drone delivery service in Finland next year, it has announced. In December 2013, Amazon chief executive Jeff Bezos predicted his company’s Prime Air delivery service would launch within five years. It said it had chosen Finland for its European trial because Finnish people were “renowned for being early-adopters of new technologies”. But Wing says drone delivery is “safer, faster and more environmentally friendly than ground delivery”. Wing is part of Alphabet’s Other Bets division, which includes self-driving car project Waymo and internet-delivery-balloon-maker Loon.